If you like to shop you will like San Gimignano. San Gimignano is one of my favourite hill-top towns. A big statement to make hey, when we know there are many fabulous hill-top towns in Italy. I have visited San Gimignano many times and always enjoy it. Yes it is a touristic place – but which one in Tuscany is not? Just don’t that let it get you down and do visit the town. It is unique and you will enjoy it. If you can, be there early in the morning or in the late afternoon. And do visit the streets away from the main one – they are almost deserted – here you could feel how the locals live in a medieval town. The streets are filled with artisanal shops selling intriguing items to bring back home. 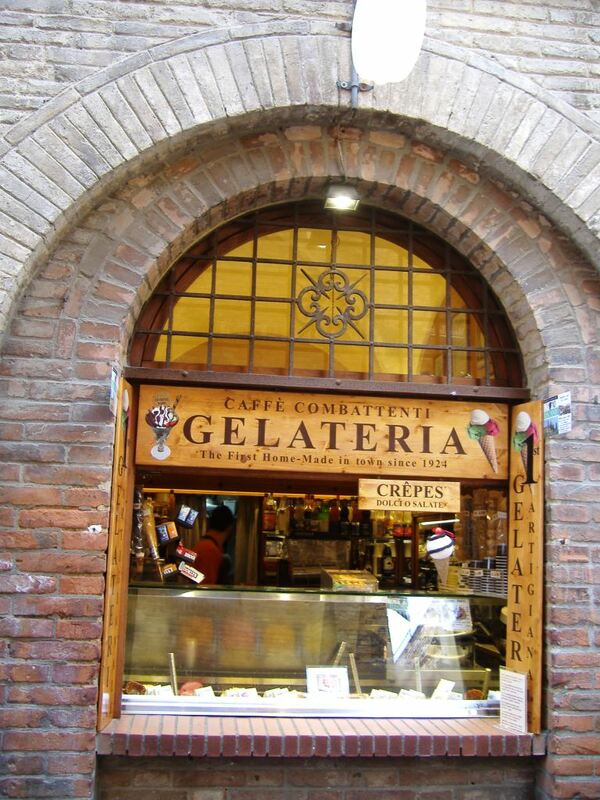 Most notable are the shops selling gourmet products such as olive oil, wines, pasta and other delicacies. San Gimignano is very famous for its wonderful ceramics works. There are many shops along Via San Giovanni where you can find plates, vases, potteries and much more. All of them are hand painted. A piece of pottery from San Gimignano certainly is a nice memento to take back home to remember this fantastic town. Shopping for leather purses in San Gimignano is also very enjoyable. The selection of leather purses here is unlimited! Like Florence, San Gimignano offers a variety of stores with a huge selection of different kinds of leather purses, belt bags, shoulder bags, wallets, attaché cases, belts, travelling bags, backpacks, book covers, coin purses, etc. I have visited San Gimignano many times arriving each time by a different method. My first visits were by coach. I have also taken the sita bus from the Florence main train station to Poggibonsi where you change buses. We had a half hour wait which was plenty of time for a coffee and pastry and then we hopped on the bus which took us up to San Gimignano. The entire trip took us about 2 hours. The last time I was there I drove our rental car from Bagni di Lucca which took about 2 hours. It was an easy drive and upon arrival we found parking very easily as there were lots of parking spaces. If you have the time to spend a night or more in San Gimignano you will see a different side of this lovely hilltop town. Once the coaches and the many tourists have gone you can enjoy the quietness. Stop by one of the many restaurants with a view and enjoy a cold one overlooking the beautiful Tuscan Hills. I have dined at several restaurants here and can easily say that I have never been disappointed. Wherever we travel, we are mostly aware of the many types of accommodation on offer. The choice is varied including hotels, motels, B&Bs, guesthouses and monasteries. Sometimes we chose to rent an apartment or house, particularly if we plan to stay in the one area for an extended period of time. Agriturismo – a combination of the words for “agriculture” and “tourism” in Italian – is a style of vacationing in farm-house resorts codified into Italian law in 1985. These agritourismi allow the small farmer to augment the income from the farm, and for vacationers to sample the bounty of a rural life in Italy. 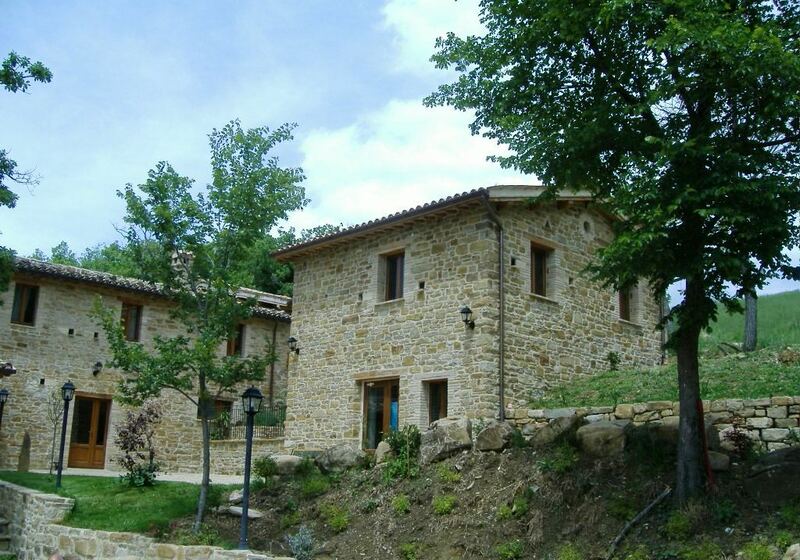 Often they have their own vineyards so the wine you may enjoy with your meals is also locally produced. Agriturismo, farm-house holiday accommodations, can be found in many parts of Italy and are popular with those travelling by car. Agriturismo is a great lodging option for families or groups of friends traveling together and accommodations can range from rustic to luxurious. Most farm houses offer bed and breakfast and some have a swimming pool, restaurant, cooking classes, or other special ammenities. Agriturismi (plural) are not usually in the centre of town but are found out in the countryside on their own parcels of land. Each one that I have stayed in we needed a car to get to. Agriturismi (plural) are also a popular place for Sunday lunch. They are a great little getaway for families and friends. It is a wonderful way to taste local foods which are prepared from home-grown produce on the farm or at least locally. Eating at an agriturismo is also a great way to meet up with people away from the busy restaurants and cafes in the cities or towns. Each time I have stayed in the village of Pievebovigliana we have enjoyed lunch and dinner at the fabulous agriturismo Roccamaia. The welcome we receive when we arrive is like we are coming home. The owner and his wife make the choices for our dishes which keep coming for hours. Each course is washed down with a locally produced delicious wine. At this agriturismo, it is not unusual for the staff including the chef to join in for a song or two. A mid day meal at this or probably any agriturismo is usually a 4 or more hour gustation. And, don’t be surprised if you are offered a small glass of homemade grappa or limoncello before you leave the establishment. And the nicest surprise at the end of the meal is the bill, it is usually very good value. Our experience with staying at an Agriturismo has always been very enjoyable. The evening meal and breakfast is often a family type affair, other guests and sometimes the family of the owners have joined us. I initially purchased a book from a tabacchi on Agriturismo. This book listed hundreds of agriturismi around Italy. You can also find them online, just google – Agriturismo.